Upgrading your home’s floor to laminate flooring is the affordable, convenient way to enhance the character of your living space. 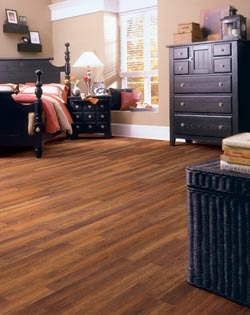 With the welcoming, classic appearance of real hardwood, laminate provides luxury at a budget-friendly price. Whatever your interior design layout, laminate flooring has a color and pattern to tie it all together. Available in virtually any style, laminate from our collections is one of the most versatile flooring options manufactured today. With so many options in our laminate collections, you are sure to find the flooring that best suits your needs in looks, performance, and price. It is a lightweight material made by heating together, or laminating, a fiberboard or melamine core, a moisture barrier, and a top-layer applique that imitates natural surfaces. Additionally, laminate is easy to maintain and withstands heavy amounts of foot traffic. Moisture resistant, hard to chip or scrape, a laminate floor is the ideal flooring product for your most used areas. When you use laminate, you’re giving your floors a stylish look that is sure to last. Whether you want classic or contemporary, we offer a wide variety of laminates to suit all your decorating needs. Our durable laminates come in a wide variety of styles. Thanks to today’s advanced production techniques, a laminate floor not only mimics wood’s color and general appearance, but embossed and scraped finishes reproduce wood’s graining and texture as well. From traditional hickory and pine to the worn look of repurposed wood, our laminate options come in a diverse array of styles to choose from. Our laminates can complement any design’s motif. We offer the top laminates from leading brands such as Star Value and Floorcraft to make your floor look better than ever. Our high-quality, affordable laminates are guaranteed to give your home a charming, sophisticated ambiance. Not only attractive, laminate also provides comfort; the material yields some underfoot, so it is easier to stand on laminate for long periods of time than on harder surfaces. Laminate is also easy to clean. Resistant to stains and mold, it requires no more maintenance than regular sweeping and mopping. This sturdy material is the right choice for your living room, hallways, dining room, and bedroom, anywhere that takes heavy foot traffic. Choose a laminate floor for an elegant look that will stand the test of time. We are happy to guide you every step of the way—from selection to installation. After you’ve selected which of our stunning laminates will best enhance your living space, our laminate flooring installation team will do the job professionally and efficiently. Like any flooring material, laminate poses its own unique installation challenges. Our professionals, though, are the easy choice for expert laminate flooring installation. We have the experience to know how to get the job done right. Trust us to lay down your new laminate flooring. In no time at all, you’ll be enjoying this wonderful upgrade to your floor that will last for years to come. Contact us today to get started on your luxury laminate flooring project. We proudly serve customers in and around Worcester, Massachusetts.